Alyssa and “Sparky” took a trip to Canadian Toller National Specialty in July. They both have reason to be very proud of themselves. In a field of 22 Tollers entered in the WC, only 6 passed. “Sparky” was one of those six to earn his WC Title. Alyssa writes: “Almost all of the dogs that went before us didn’t go to the bird but instead went out and wandered around and took many pitt stops out in the field. “Sparky” marked each bird PERFECTLY and didn’t stop and went straight out and straight in with great SPEED.” His water work was spectacular and he delivered to hand on each series.The Judges told Alyssa what a good job marking and staying focused “Sparky” did! After the test, folks gathered around Alyssa and “Sparky” to find out more about him. Alison Strang was there who wrote the book on Tollers and is a well known breeder. 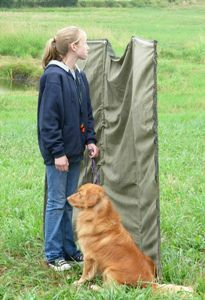 She said it was one of the best jobs she’d seen of a toller in field WC. WOW!!! Talk about being recognized. “Sparky” continued to be succesful in the conformation ring being shown by Alyssa and his breeder and taking 3rd Place both days he showed in breed. Amongst tough International competition. “Sparky” is an awesome retriever and is exciting to watch. His birdiness and drive is undeniably a testament to his natural instinct. His trainability and team work with Alyssa is a wonderful sight to behold. They plan to go on and train in field for his Junior Hunter title now. Congratulations to you both. I am very proud of you!!! “Trumper” and Barbara also took a trip up to Canada in July, and came back with their WCI and CD Titles. Barbara called me to tell me the good news. “Trumper” received compliments from the Judges at the WCI test. Passing the first time, “Trumper” had been entered twice. Barbara decided to give the WCX a try instead of rerunning the WCI test. The Canadian WCX does include a blind too. Despite not passing the test Barbara was well pleased with the marks “Trumper” did and he even (despite only just starting to train for handling) did take the back command on the blind but was not quite ready for the handling part. “Trumper” is currently working toward his Senior Hunter, WCX and CDX Titles. Congratulations to you Both! Good Job!!! “Finn” and Suzanne went to Gervais, Oregon and completed their 3rd JH leg at the Salem Retriever Clubs Hunt test on 7/22/2007. Suzanne said despite her having problems focusing due to the excessive heat and humidity “Finn” was able to perform flawlessly. It did turn out to be a very trying day for both of them as an accidental shooting of one of the gunners caused an almost 3 hour delay. The shooting occured while Suzanne and Finn were waiting for the live flier duck to be shot on the water series. According to Suzanne the gunners from the live flier station were so focused on shooting the duck that as the bird flew up and outward they shot the gunner at the dead bird station in the face. I can only imagine how scarey it all was. All I can think is how important it is at these tests to adhere to the Hunters Safety course policy. Don’t shoot if there is any chance of hitting a person!! It’s not worth it! Congratulations to both of you! Let’s go out and get that JH Title soon. Finn is currently in field training working on his WCX and Senior Hunter title. This boy has lots of trainability and drive.